Whether you are looking for a cheap last minute holiday, an all inclusive family hotel or a luxury 4 or 5 star property, Vilamoura has a wide variety of holiday accommodation to suit everyone. Vilamoura is one of the Portugese Algarves' most well known resorts, the focal point of Vilamoura is the lovely yachting marina, the resort does however spread out over a large area covering some 2000 hectares. 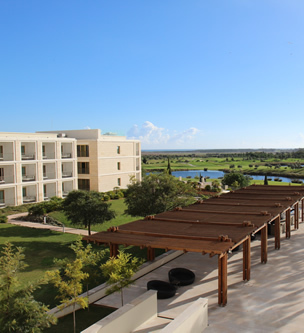 The owners of Vilamoura are extremely environmentally conscious and every effort is being made to protect nature within its continued and carefully planned development. There is also a touch of history, within the centre of Vilamoura there is a preserved Roman Site and Museum. This large resort offers the visitor nearly every form of sport and entertainment, its southern border is the Atlantic coast with its long sandy beach, lined with quality hotels, self-catering apartments, numerous restaurants and shops, and a host of leisure facilities including a casino. Amongst the many attractions and facilities there are five different golf courses, a lawn green bowling club, a tennis centre, a sports club, a shooting club, 5 Star and 4 Star Hotels, tourist apartments, self-catering Villas, nightclubs, casino, cinema, a private airstrip and an excellent riding school! Dedicated shopping areas and arcades were designed to be an integral part of the Vilamoura development, packed with designer boutiques, shoe stores, sport's outlets, perfumeries, tobacconists, jewellers and much more. For bargain hunters you can make an expedition to the Saturday market in nearby Loule. Night-time is fun time in Vilamoura, where bars, discos and live entertainment venues abound. Everything from traditional Portuguese tavernas to bawdy British pubs and karaoke bars! Vilamoura's international Casino offers nightly dinner shows in addition to gambling tables, slot machines and bingo rooms. There are an abundance of restaurants to suit all tastes from fine dining international cuisine to fast food outlets.